Reverend Willard Johnson, 84, of Chattanooga, went home to be with his Lord and Savior on Saturday, November 24, 2018, at his home, surrounded by his loving family. He spent his life serving God for 35 years in full time ministry. He pastored churches in Louisiana and Tennessee. 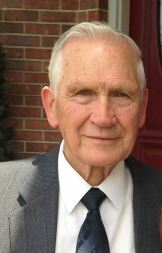 Reverend Willard served as pastor for Calvary Church of the Nazarene in Chattanooga for almost 26 years. He was a devoted husband, father, granddaddy, and great-granddaddy. He was loving, kind and compassionate to all. Only eternity will reveal the scores of souls who were pointed to Christ through his influence and faithfulness. He loved the ministry and often talked with tears streaming down his face of the many wonderful people he had the privilege of pastoring. To quote him, “the proudest privilege of his life was to be called a Christian”. He was preceded in death by his parents, Wiley and Vera Johnson; three sisters, Pauline Raper, Frances (Jeff) Maynard, and Ruth (Bud) Foster. Willard leaves behind his devoted wife of 63 years, Beulah; children, David (Teresa Flaherty) Johnson, Teresa (Greg) Anderson, and Joe Johnson; five grandchildren, Tiffany (Kris Tellado) Anderson, Christopher Anderson, Matthew (Becca) Johnson, Bradley Johnson and Meghann (Barrett) Case; three great-grandchildren, Logan Anderson, Coraline and Amalie Johnson. The family will receive friends from 5-8 p.m. on Friday, Nov. 30, at the North Chapel of Chattanooga Funeral Home and 11 a.m.-1 p.m. on Saturday, at Calvary Church of the Nazarene, 4400 Bonny Oaks Drive, Chattanooga, Tn. 37416. A Celebration of Life service for Willard will be held at 1 p.m. on Saturday, at Calvary Church of the Nazarene with Reverend Charles Knight officiating. Burial will be in Hamilton Memorial Gardens.